Boots and BriarsBuying Quail Land? 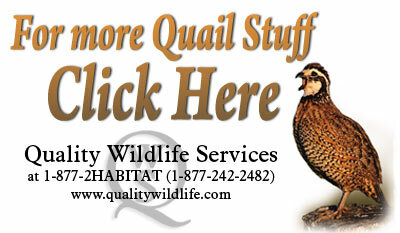 Boots and Briars » Buying Quail Land? Quail are a species that prefer a early plant succession habitat, better known to most of us as WEEDS and NATIVE GRASSES. For quail, the best number of trees per acre is ZERO, but most of us in the southeast are going to find ourselves dealing with a woodland setting of some kind. How much income can I generate by removing most of the timber and when? How much will it cost me per acre to treat the cut-over areas with a forest herbicide to make sure the acreage becomes quail habitat and not a jungle of hardwood brush? Am I paying for existing improvements ( extra structures, ponds, improved pasture, planted pine stands, etc.) that I will have to spend money to remove or dont need. Asking yourself these questions as you look at different tracts, can help you zero in on your options. For instance, if the parcel of land has recently been cut- over, you will not be able to generate any immediate income from timber sales to put back into the property for brush control. If the seller has conducted a site-prep herbicide treatment and replanted with Loblolly or Slash pines, then you would be paying for the land, herbicide work, plus the establishment of pines trees that are poised in a few years to eliminate your quail habitat options. On the other hand, if the seller has conducted a chemical site prep after the harvest, but not yet replanted the acreage with pines, then your timing would be great. In this case the stage is set for your quail project to begin without having the additional cost of chemical work or paying for the planted pines improvements that you dont want. If you are looking at land that was cut over several years ago and no effort was made to follow up with any brush control measures, then you should try to negotiate the price per acre down so that you can afford to do the application of forest herbicides ( about $90/acre) after the purchase. If this is not possible then keep looking for a tract that will cost less per acre to produce quail habitat. If the land was established in longleaf pine then the situation changes. Longleaf pine is a different critter. There are government programs out there that are trying to increase the acreage of longleaf and native grass ecosystems. If you run across one of these tracts up for sale, then you may have the option to combine some quail hunting with some degree of future timber income. Longleaf pine does not shade out the under-story habitat to the degree of most other pine species. Also, control burning can be initiated in it at a much younger age than the typical loblolly stand. With proper management you can keep the ground cover in quail habitat right up until you start thinning the pines. These are just a few examples, but I believe you get the idea. Going back to the original questions can help you think things through and sort out your options before buying forested land for a quail project. FOR SALE EXCELLENT HUNTING LAND. 150 ACRES OF CROP LAND PLUS 2 LARGE PASTURES, 400 ACRES TOTAL. FIFTEEN MILES FROM INTERSTATE. Much of the unforested land that is available falls into two basic categories: crop land and pasture land. When you come upon quail land of this type, you may want to ask yourself similar questions to those asked about forested land, such as the initial cost per acre and what income can you generate on the land to help off set management costs. Also, you need to identify what type of beneficial or non-beneficial vegetation presently exists on the property. For instance, if you are buying old pasture land, the basic landscape is probably covered with some type of sod-forming grass. Common ones are coastal bermuda, fescue, or bahia grass. These species are good for grazing and hay production, but have to be removed in order to allow native weeds and grasses (quail habitat) to flourish . In this case, ERADICATION of sod-grass is the goal, but in reality you will probably end up just gaining CONTROL of the acreage. By this I mean that you will be able to convert most of the area back into quail habitat, but you will still have to treat trouble spots each year to keep the sod-grasses in check. This will be a necessary cost in this situation, so remember this before you buy. One way to off set the cost of converting sod-grass to quail habitat may be to rent the land out to a farmer who is willing to plant Round-Up ready corn or soybeans for a few years. This way you can receive an income from the farming while the farmer is removing the grass problem in the crop fields. In these situations, you can often pay the farmer to chemically treat the sod-grasses on the field edges as well. Once the sod-grasses have been eradicated from the field borders, you could then establish them in weeds and native grasses. After a couple of years, the Round-Up ready farming practices will present you with the option to expand your quail program by converting some of the crop fields to quail habitat or expanding the width of your field borders. If you are considering the purchase of active crop land, carry some of these thoughts with you. Interview the landowner about past and present farm practices and evaluate the kind of vegetation that is present in fallow areas and field borders. One last point about purchasing land for a quail project. While looking at maps and talking with the seller, find out what is taking place on the adjoining tracts. Does the property you are considering back up to another quail project or is there a trailer park loaded with roaming house cats along your southern border? Nearby activities can affect the success of your quail project, so ask about them before you buy. 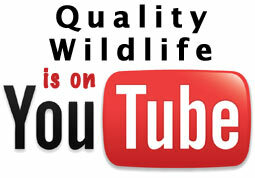 I hope this discussion will be of assistance to those of you fortunate enough to purchase some land for a quail project. Keep focused on your objective for buying the land, and what you will have to do after the purchase to achieve your goal. There is a lot of land out there for sale but remember, all that shimmers is not gold.